Matereality (www.matereality.com), offers software for material data visualization, CAE material parameter conversion, and management. The goal is to provide fast, easy-to-use services that foster in-depth understanding of purpose-specific material behavior, eliminate typical risks associated with generic data, and accelerate the pace of product development. Materials information is an aspect of product data that must be accessible by engineering teams at many phases of the product lifecycle. 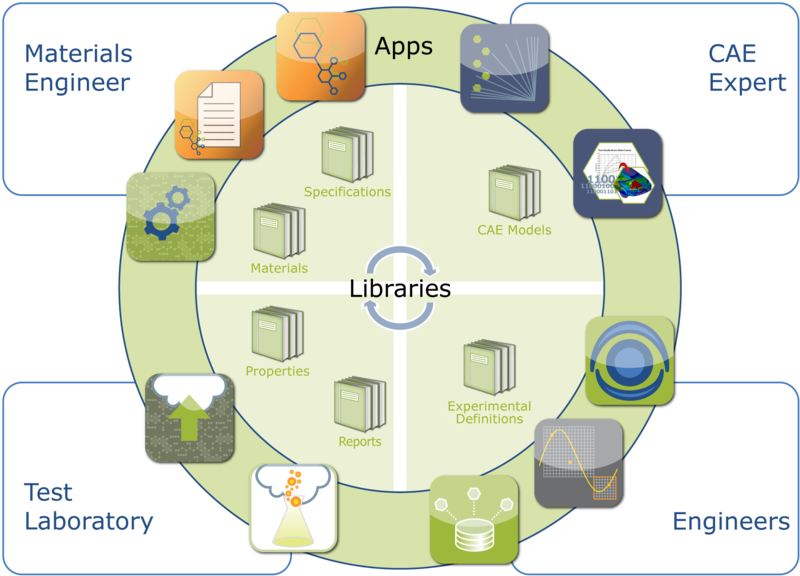 Every aspect of this complex and highly varied data can now be carefully organized in libraries and supported by analytical tools and software modules to aid materials engineers, CAE engineers, test labs and designers in their daily tasks. When deployed across the enterprise, the Matereality software brings harmony, efficiency and control while minimizing risk. Matereality provides material database creation software, productivity enhancing software, and customized application management solutions for groups and individuals involved in manufacturing enterprises. Our goal is to aid in all of the steps of product lifecycle management, enhancing productivity, and eliminating potential risks from inappropriate use of material data. Introduction to user tasks in materials information management with Matereality Workgroup Material DatabasePro software. Systems simulations involve material models for many materials. Since different kinds of simulations may be performed ranging from NVH to crash, such material files exist for a variety of solvers. It is a difficult task to ensure the self-consistency of material nomenclature for all these cases, such that the materials information is current and the right material files are used for each material. We present a system where materials information is uniformly deployed to CAD and CAE from libraries set up in Matereality. Consistent naming conventions and unit systems are used. Material files are linked to source material data for reference and traceability. We describe a new software component that takes into consideration the unique multi-variate nature of LS-DYNA material models. Rate-dependent models require adjustment and tuning of many material parameters to fit the rate-dependent tensile properties. Drawing upon a robust back-end data model, a graphical user interface provides drag and drop capability to allow the user to perform tasks such as model extrapolation beyond tested data, modulus change, rate dependency tuning and failure criteria adjustment while assuring self-consistency of the underlying material model. Unit system conversions are also facilitated, eliminating error and ensuring that material inputs to simulation correctly reflect the intent of the CAE analyst. The utility of the Matereality CAE modelers is illustrated with examples for LS-DYNA material models MAT_019, MAT_024 and MAT_089 LCSR. The Export to ANSA capability for nonlinear CAE applications is included in Matereality v9. Once your Matereality database has been populated with CAE Material files, you can select the ones appropriate for your analysis and export them to a master material file for ANSA. Then use the ANSA plug-in to import it, and apply the desired material file to your analysis. LS-DYNA contains a wealth of material models that allow for the simulation of transient phenomena. These models are often quite complex and difficult to calibrate. We present CAE Modeler, a generalized pre-processor software used to convert material property data into material parameters for different material models used in CAE. In this paper, CAE Modeler is used to streamline the conversion of rate dependent stress-strain data into material parameters for the MAT_024 material model. The interactive software is capable of handling all three rate dependency options of MAT_024 and outputs a data file that can be read directly into LS-DYNA. Support for other material models is envisaged. Virtual product development today has become a complex process involving CAD, FEA, CAE, and physical testing. Material properties form the glue that link the simulation and real life behavior together. Most often, the properties of the materials used in different stages of the product life cycle vary depending on the application. Hence, the engineers and technicians within the enterprise need to have access to not just the simple single point properties that help determine the suitability of a material, but also the more detailed behavioral property data that affect design, simulation and failure analyses. A common platform for the storage and effective deployment of these properties system wide is critical to the efficiency, cost, and quality control through PLM. We present a technology, Matereality that accommodates diverse properties of all the different materials used by an enterprise, its suppliers and collaborators. The cost benefits are immediate, besides improved interoperability and consistency in material data use through the enterprise. "Matereality v9 - Export to ANSA Workflow"
"Pre-processor Software for Calibration of LS-DYNA® Material Models"
"New Generation Modeler for LS-DYNA Material Parameter Conversion - paper"
"New Generation Modeler for LS-DYNA Material Parameter Conversion - presentation"
"A Process for Creating, Managing and Deploying Materials in ANSA - paper"
"A Process for Creating, Managing and Deploying Materials in ANSA - presentation"
"Enterprise-Wide Materials Data Management Ensures CAE Fidelity - paper"